Using bioassay guided fractionation, 16 glycosides, including two new compounds (1 and 2), were isolated from the anticomplement and anti-inflammatory portion of an Urtica fissa rhizome decoction used for arthritis. Several compounds were found to possess significant anticomplement and anti-inflammatory activities. 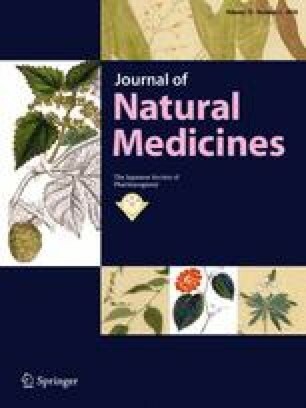 This study revealed that glycosides played an important role in the therapeutic effects of Urtica fissa rhizome. This study was financially supported by a grant of National Natural Science Fund of China (No. 81374067). The online version of this article ( https://doi.org/10.1007/s11418-018-1172-3) contains supplementary material, which is available to authorized users. This study was financially supported by a grant of the National Natural Science Fund of China (No. 81374067). The authors would like to thank Dr. Bona Dai of the Instrumental Analysis Center of Shanghai Jiao Tong University for NMR measurement. The authors declare that there is no any conflict of interest to disclose.